Attorney Lynn C. Harris has helped countless clients from the greater Provo area, ensuring that injury victims and their loved ones receive strong legal representation. Personal injury lawsuits hold negligent individuals and parties accountable, and can actually contribute to making the world a little safer. With this in mind, we'd like to consider a common source of injury that many people don't think about often: wet floors. These are serious slip and fall hazards, and they can actually be addressed quickly and easily. When there's a spill or any kinds of moisture on a linoleum or hardwood floor, business owners need to take these matters seriously. Slipping hazards such as these at a premises can cause serious accidents and injuries. This is a common issue are establishments such as grocery stores, hotels, and hospitals, though it can even be an issue at museums, restaurants, and other kinds of properties. When a slipping hazard has been identified, it's important that these be marked as such and cordoned off when possible. Just by having a "wet floor" sign in the area can be a major help and can prevent serious injuries. Once the slipping hazard has been marked, an employee should mop and dry the potential hazard as soon as possible. This will prevent any injuries or accidents from occurring, and it's a common sense solution to the issue as soon as it happens. 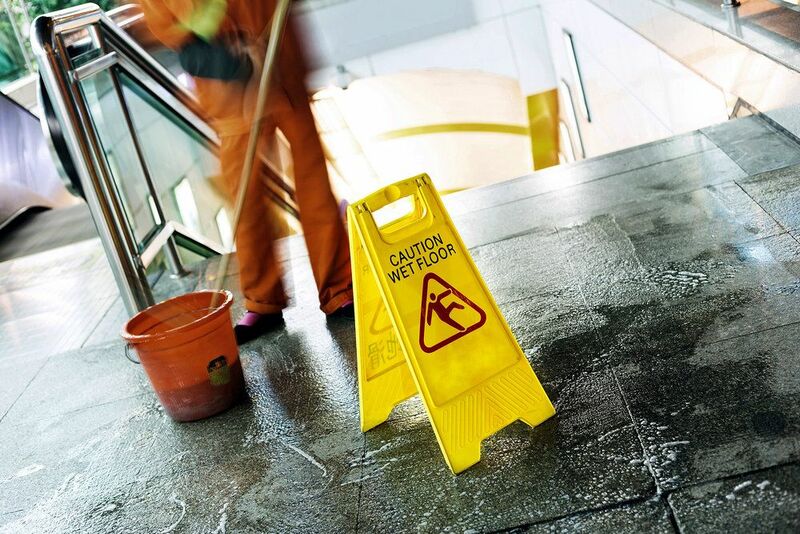 It's a good idea to have employees note any potential slipping hazards at a business or establishment, particularly if it's a rainy day or if the business is prone to potential slipping hazards. For instance, grocery store employees that are on the floor stocking items should note potential spills or broken bottles/packaging that may cause a potential slip and fall. These three steps can go a long way toward preventing injuries at an establishment. It's important that property owners be carefully attuned to these concerns, and that they exercise common sense when it comes to potential hazards to anyone at a property. By remaining mindful, mishaps can be prevented. Following a slip and fall accident, it's important that you seek medical attention right away if you have suffered an injury. If the slip and fall was the result of negligence on the part of a business or proerty, be sure to speak with an attorney about your case. This will help cover medical expenses and lost wages, and it will also help hold the business or property owner accountable, preventing serious mishaps from occurring again at that establishment in the future. For more information about your legal options following a serious slip and fall accident, it's important that you contact a skilled personal injury attorney about your case today. Lynn C. Harris will work closely with you during the legal process to ensure a successful resolution.